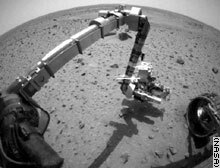 The Spirit rover reached for Martian soil for the first time January 16. Make your own 3D glasses in time for an eye-popping tour of Mars at 10 p.m. ET Friday on NewsNight. (CNN) -- The Spirit rover has stopped transmitting data from Mars, NASA mission controllers said Thursday, but there were signs it is still operating at a basic level. NASA scientists now have received a basic communication tone from the rover indicating it is alive but the solid flows of data that marked its first 18 days on Mars have stopped, said Richard Cook, deputy project manager, speaking from the Jet Propulsion Laboratory in Pasadena, California. The tone is programmed into the spacecraft, to be emitted when there is a serious problem onboard. "We know that we have had a very serious anomaly on the vehicle," said Pete Theisinger, manager of the $400 million Spirit mission. "Our ability to determine exactly what has happened has been limited by our inability to receive telemetry from the vehicle," he told reporters Thursday. To find out what went wrong, scientists need additional data. But the equipment needed to transmit that information back to Earth may be broken, sources told CNN. The team was pursuing several scenarios, such as a possible software crash or a problem with the solar power supply. The next opportunity for communication comes at 10:10 p.m. ET, when the Mars Global Surveyor satellite is expected to pass over the rover. The problem, which began Wednesday, was initially blamed on rain in Canberra, Australia, where NASA operates a major radio dish that receives radio messages from space. But several opportunities to communicate with Spirit since then have come and gone with the space agency receiving no solid data, said Cook, who managed the ill-fated Mars Polar Lander, which presumably crashed into Mars in late 1999. Mars project engineers sent a query to the rover Wednesday afternoon and it did respond. But the craft was silent when the Mars Odyssey, a satellite in Mars orbit, passed over the six-wheeled robot, Cook said. Later, when another red planet satellite, the Mars Global Surveyor, passed over the rover, NASA received radio communication but no data. Several opportunities came and went Thursday with no communication. But later the basic communication tone was received. In its 18 days on the red planet, the rover's performance has been virtually flawless. JPL scientists were reviewing the early data Thursday to see if they might have missed some predictor of trouble. --CNN's David Santucci, Miles O'Brien and Jeordan Legon contributed to this report.